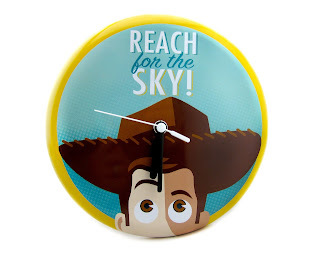 As part of last fall's initial line of Hallmark exclusive Pixar decorative products, here we have one I was looking forward to getting for quite some time- this Toy Story Woody wall clock! This is a very cool metal clock with a fantastic minimal Woody design and classic phrase "Reach for the Sky!". This was released almost a year ago in stores, but has stayed around to celebrate this year's 20th anniversary of Toy Story. Can you believe it's been that long? The size of this clock is 7" dia. x 1" D, retails for $19.95 and requires one AA battery. You really can't go wrong with this one if you're any type of Toy Story fan and/or collector. It's a real solid product that works well and has a great design- the perfect addition to any Pixar themed room! If you're looking to add this clock to your collection, be sure to check out your local Hallmark store or their website HERE. Please let me know if you have any question or comments!